The FeedbackDisplay object as it appears in the Toolbox. The FeedbackDisplay object is derived from the Slide object, but is specifically designed for the presentation of feedback. Because the FeedbackDisplay object is itself a kind of Slide object, it houses a collection of SlideState objects each with its own sub-objects and property settings. Thus, a single FeedbackDisplay object may be customized to present varying types of feedback. However, the FeedbackDisplay object is unique in that it is used to present feedback based on the input collected by another object. Thus, the FeedbackDisplay object interacts with another object to obtain the input information, then evaluates the input and presents the appropriate feedback information. A new FeedbackDisplay may be opened by clicking the FeedbackDisplay object icon in the Toolbox, and dragging the object to the Workspace or to a location within the hierarchy represented in the Structure view. For an existing FeedbackDisplay object, clicking the object once with the mouse in the Structure view to select it will result in the display of that object’s properties in the Properties window. Double clicking an existing FeedbackDisplay in the Structure view will open the object in the Workspace, and the properties for that object will be displayed in the Properties window. A FeedbackDisplay object opened in the Workspace displays the name of the object and the FeedbackDisplay icon in the title bar at the top of the object window. Below the title bar, the toolbar lists the tool buttons associated with the FeedbackDisplay object. Allows placement of a SlideText sub-object for the display of text. Allows placement of a SlideImage sub-object for display of an image. Allows placement of a SlideMovie sub-object for display of a movie. Allows placement of a SlideButton sub-object for display of a button/defined target area. Allows placement of a SlideChoice sub-object for presentation of survey-type stimuli. Allows placement of a SlideSlider sub-object for presentation of survey-type stimuli. Allows placement of a SoundOut sub-object for playback of audio stimuli. Allows placement of a SoundIn sub-object for the recording of vocal responses . Brings the selected sub-object to the foreground if several sub-objects are overlapping. Sends the selected sub-object to the background if several sub-objects are overlapping. Activates the cursor in order to select a specific sub-object. Allows the user to zoom in on a selected portion of the FeedbackDisplay object by clicking the left mouse button. Right clicking performs the reverse action (zoom out). Allows the user to zoom out on a selected portion of the FeedbackDisplay object by clicking the left mouse button. Right-clicking performs the reverse action (zoom in). Toggles the display of the grid in the display area. Dropdown box allowing the selection of the item to receive focus (e.g., entire FeedbackDisplay object, SlideState, sub-object) for the display of properties and various alterations. Dropdown box that displays the various Slide Layout Templates. Displays the Property pages for the Feedback Display. Displays the Sub-Object Property pages for the item displayed in the dropdown box (e.g., SlideState, sub-object). The display presented by the FeedbackDisplay object is represented in the window below the toolbar. The FeedbackDisplay window contains a set of tabbed pages defining the different types of feedback to be presented during the experiment. Separate tabs are presented in order to define feedback for correct and incorrect responses, as well as for non-responses, and responses that may be pending (this option reserved for future use). Each tab in the FeedbackDisplay window is actually a SlideState object, and the FeedbackDisplay object is the parent to the collection of SlideStates (refer to E-STUDIO: SlideState Object  for a complete description of SlideState objects). The FeedbackDisplay object maintains its own properties, properties applied to each SlideState object, and properties applied to each sub-object defined on the SlideState objects. The user must take care to select the appropriate object for modification and the display of properties. Each item contained within a FeedbackDisplay object may be selected by clicking it, or by selecting it from the dropdown box located on the FeedbackDisplay object’s toolbar. To select a specific sub-object, the SlideState object containing that sub-object must first be selected. For example, to modify the text presented in relation to an incorrect response, first select the SlideState object named “Incorrect” by clicking the “Incorrect” tab at the bottom of the FeedbackDisplay window, or through the dropdown box. Once the appropriate SlideState object is selected, its sub-objects may be viewed and selected. The FeedbackDisplay object itself is selected by clicking the frame area surrounding the display, or through the dropdown box on the toolbar. The properties displayed in the Properties window are relevant to the currently selected object or sub-object. Property pages for the FeedbackDisplay object may be displayed using the Property Pages tool button on the FeedbackDisplay object toolbar. Because the FeedbackDisplay object houses collections of SlideState objects and SlideStim objects (i.e., sub-objects), it is important to note that the properties displayed in the Properties window are in reference to the currently selected object. The user must take care to select the appropriate object in order to display the relevant properties for modification. To select the FeedbackObject, click on the frame area surrounding the display, or through the dropdown box on the toolbar. The General tab identifies the input object for which the feedback information will be determined, and determines the types of statistics to collect. 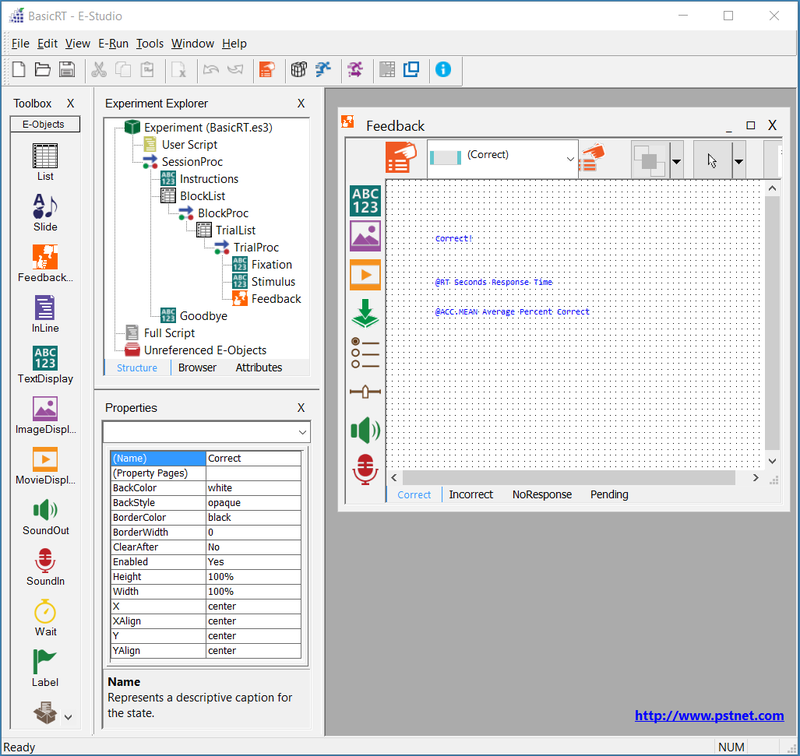 Input Object Name Identifies the object collecting input for which the feedback will be displayed and statistics will be calculated. Collect ACC Stats Determines whether accuracy statistics are collected. 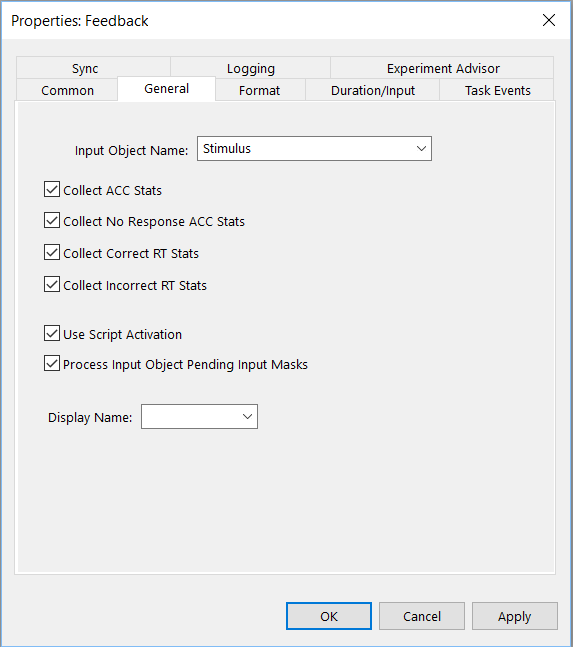 Collect No Response ACC Stats Determines whether non-responses are included in accuracy statistic calculations. Collect Correct RT Stats Determines whether reaction time statistics are collected for correct responses. Collect Incorrect RT Stats Determines whether reaction time statistics are collected for incorrect responses. Use Script Activation Determines whether the object should use custom user script for its logging activation. Process Input Object Pending Input Masks Determines whether Pending Input Masks are processed. Display Name Determines the display the Feedback is shown on. 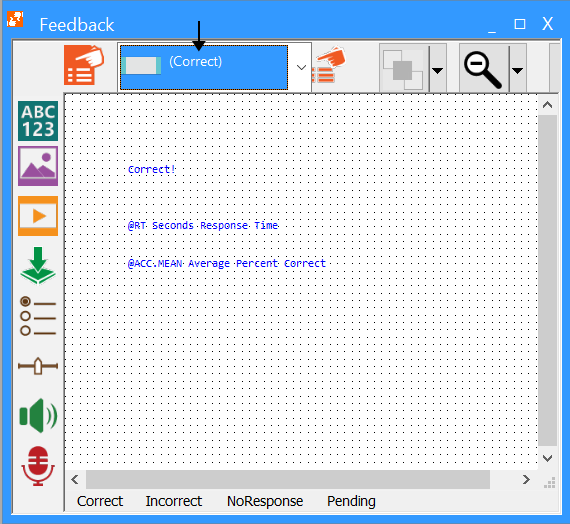 The Format tab defines the format used when displaying feedback. The divisor fields determine the units in which the feedback for accuracy and reaction time occurs. A general format may be applied to all responses, or the format may be customized for correct and incorrect responses. ACC Divisor Numeric Determines the units for the accuracy display. ACC Format Percent Determines the format in which accuracy feedback is displayed. RT Divisor Numeric Determines the units for the reaction time display. RT Format Numeric Determines the number of significant digits for the reaction time display. Correct RT Divisor Numeric Determines the units for the correct reaction time display. Correct RT Format Numeric Determines the number of significant digits for the correct reaction time display. Incorrect RT Divisor Numeric Determines the units for the incorrect reaction time display. Incorrect RT Format Numeric Determines the number of significant digits for the incorrect reaction time display. The Properties of the FeedbackDisplay object may be set using the fields in the Properties window. (Name) Strings Represents the name or label of the selected object. (Property Pages) None Reveals the property page interface to specify the properties for the selected object. BackColor Color value (RGB values), Specific color strings (e.g., black, maroon, lime), Attribute references. Sets the background color on which to display the text characters (functionality depends on BackStyle property). BackStyle Opaque, Transparent Defines the style of the background on which the text is displayed. BorderColor Color value (RGB values), Specific color strings (e.g., black, maroon, lime), Attribute references. Sets the color for of the defined frame. BorderWidth Numeric values in pixels (e.g., "10"), Relative values (e.g., 10%), Attribute references. Sets the width of the border of the defined frame. ClearAfter Yes, No Controls the clearing of the defined display area after the object’s termination condition is met. Enabled Yes, No Represents whether this object is enabled or disabled. Height Numeric values in pixels (e.g., "10"), Relative values (e.g., 10%), Attribute references. Defines the height of the rectangle designating the text display area. Width Numeric values in pixels (e.g., "10"), Relative values (e.g., 10% of full screen window specified for the display), Attribute references. Defines the width of the rectangle designating the text display area. X Left, Center, Right, Numeric values in pixels (e.g., "10"), Relative values (e.g., 10%), Attribute references. Sets the X-coordinate position for the anchor position of the display area. XAlign Left, Center, Right Sets the alignment of the defined frame area along the horizontal (x) axis relative to the anchor position (X and Y property values). Y Positions (Top, Center, Bottom), Numeric string values (e.g., “10”), Relative values (e.g., “10%”), Attribute references. Sets the Y-coordinate position for the anchor of the display area. YAlign Top, Center, Bottom Sets the alignment of the y-axis of the defined frame area in relation to the anchor position (X and Y property settings). The following table lists macros that may be used to display various summary statistics in conjunction with a FeedbackDisplay object. 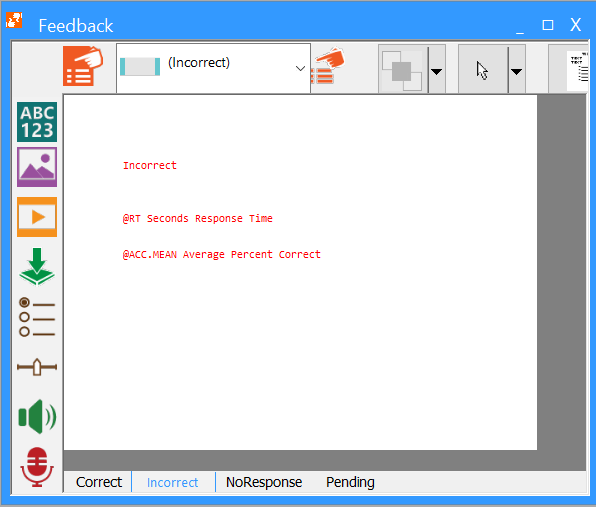 FeedbackDisplay macros allow access to statistics calculated on a collection of responses without requiring the user to write script and set attributes. These macros provide shortcuts for displaying statistics within a SlideText sub-object on a FeedbackDisplay object only. They are not available from script, nor can they be used in any other type of object presenting text. @ACC.MEAN Mean accuracy for a collection of responses. @ACC.N Number of observations in the collection of accuracy values. @ACC Accuracy for an individual (i.e., the current) response. @RT.MEAN Mean reaction time for a collection of responses. @RT.MIN Minimum reaction time for a collection of responses. @RT.MAX Maximum reaction time for a collection of responses. @RT.STDDEVP Calculates standard deviation based on the population. @RT.STDDEVS Calculates standard deviation based on a sample. @RT.N Number of observations in the collection of reaction times values. @RT Reaction time for an individual (i.e., the current) response. 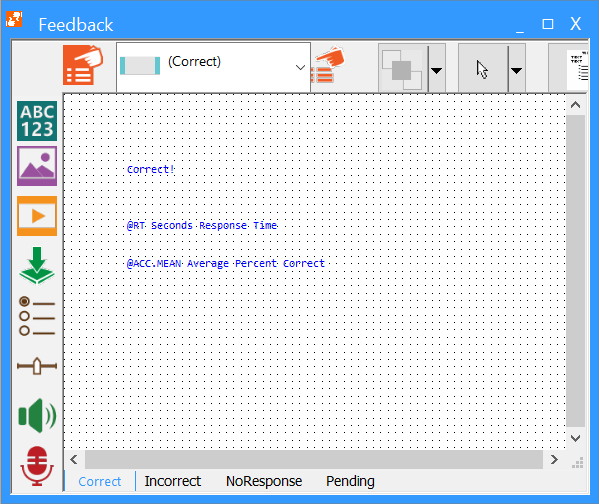 @CorrectRT.MEAN Mean reaction time for the collection of responses for which ACC = 1 (i.e., correct responses). 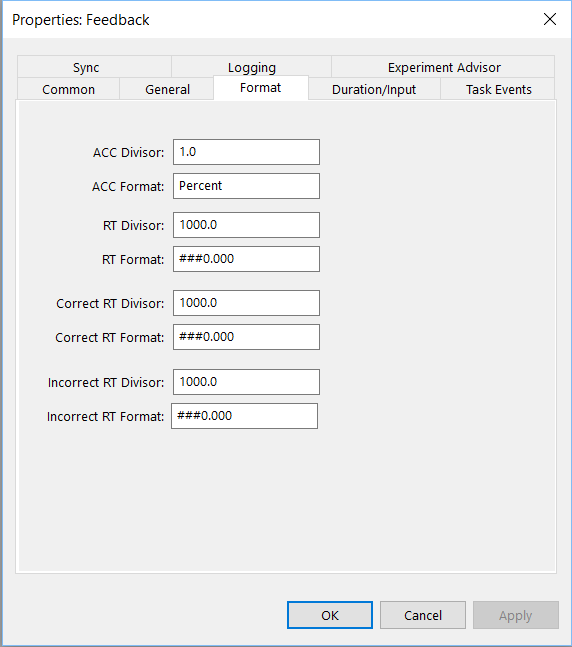 @CorrectRT.MIN Minimum reaction time for the collection of responses for which ACC = 1 (i.e., correct responses). @CorrectRT.MAX Maximum reaction time for the collection of responses for which ACC = 1 (i.e., correct responses). @CorrectRT.STDDEVP Population standard deviation of the reaction times for the collection of responses for which ACC = 1 (i.e., correct responses). @CorrectRT.STDDEVS Sample standard deviation of the reaction times for the collection of responses for which ACC = 1 (i.e., correct responses). @CorrectRT.N Number of observations in the collection of reaction times for correct responses. @IncorrectRT.MEAN Mean reaction time for the collection of responses for which ACC = 0 (i.e., incorrect responses). @IncorrectRT.MIN Minimum reaction time for the collection of responses for which ACC = 0 (i.e., incorrect responses). @IncorrectRT.MAX Maximum reaction time for the collection of responses for which ACC = 0 (i.e., incorrect responses). @IncorrectRT.STDDEVP Population standard deviation of the reaction times for the collection of responses for which ACC = 0 (i.e., incorrect responses). @IncorrectRT.STDDEVS Sample standard deviation of the reaction times for the collection of responses for which ACC = 0 (i.e., incorrect responses). @ IncorrectRT.N Number of observations in the collection of reaction times for incorrect responses.